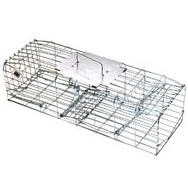 Our Squirrel Cage Trap is a humane method for trapping, catching and getting rid of problem squirrels. You can use these traps inside the home such as in the attic, loft or roof space where squirrels may have set up home! Or these rust proof traps can be used outside in the garden to trap squirrels that may be 'stealing" the bird food or digging up your plants and vegetables.